The Temperament Wheel is a visual way to look at your temperament traits and those of your child. 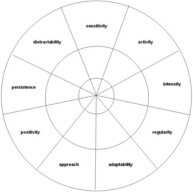 Each spoke of the wheel has a trait and an inner, middle and outer band. The inner band would be a low level of the trait, the outer band the high level and the middle band would represent an individual with a mixture of high and low levels of a trait. For each of the traits, colour in the band that would best represent yourself . Once you have completed your wheel you should complete one for your child. Then compare the similarities and differences between the two. Find out more about each temperament trait and use these Comfort, Play & Teach strategies that are tailored to different temperament traits.